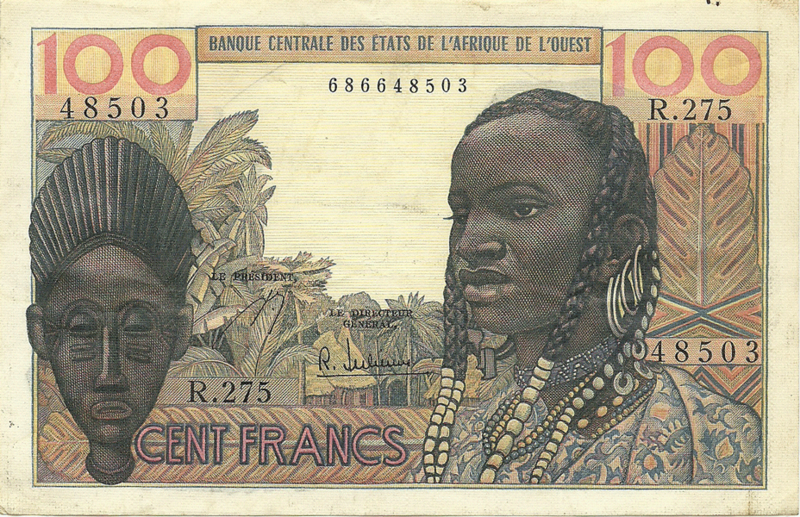 On the obverse is a girl (supposedly of the Baulé tribe) with braided pigtails, in African style. On the girl, presumably, bubu. Traditional clothes Baule - kent, bubu, richly ornamented. Europeanized clothing is distributed. The Baule or Baoulé (Baule: Baule; French: baoulé) are an Akan people and one of the largest groups in Côte d'Ivoire who historically migrated from Ghana. The Baoulé are traditionally farmers who live in the centre of Côte d'Ivoire (Ivory Coast), in a triangle shaped region (the Baoule “V”) between the rivers Bandama and N'Zi. This area broadly encompasses the regions around the cities of Bouaké and Yamoussoukro. 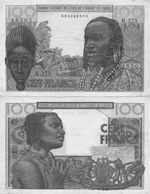 The Baoulé have come to play a relatively important role in the recent history of Côte d'Ivoire : the State's first President, Félix Houphouët-Boigny, was a Baoulé ; additionally, since the Ivorian cocoa boom of the 1960-70s, the Baoulé have also become one of the most widespread ethnicity throughout the country, especially in the Southern forests (the « Low Coast ») where they are amongst the most numerous planters of cocoa, rubber, and coffee and sometimes seem to outnumber the local native ethnic groups. The main traditional occupation of Baule is tropical hand-held with slash-and-burn agriculture (yams, taro, bananas, manioc, millet, sorghum, fonio, peanuts, with different periods of deposits); Traditional crafts - wood carving (anthropomorphic and zoomorphic sculpture, masks), blacksmith, weaving, etc. In the background - oil and coconut palms, also visible settlement. Rural settlements Baule compact, permanent and temporary on distant plots of land. The dwelling is mostly rectangular in plan, frame-pillar construction, woven from branches, walls covered with clay; the roof is high, four-sloped of raffia palm leaves. On left side is the carved mask of the Baulé tribe (Ivory Coast). 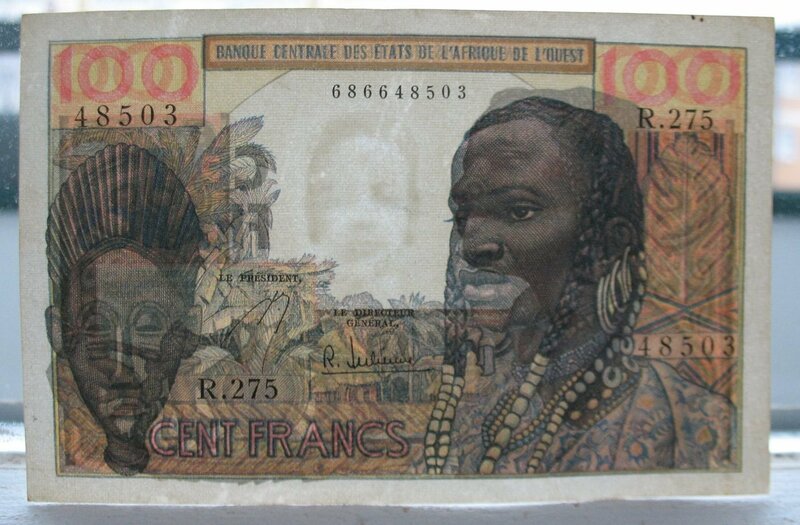 I did not find a photo of the same mask as on the banknote. 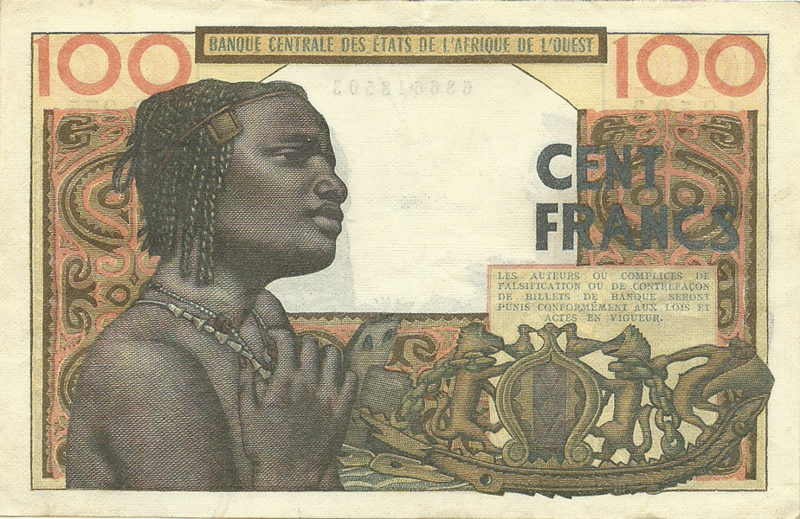 In the photo, too, the Baulé mask, the most similar to the one on the banknote (of those that I found). Denominations in numerals are in top corners, in words - at the bottom, left of center. A young man. 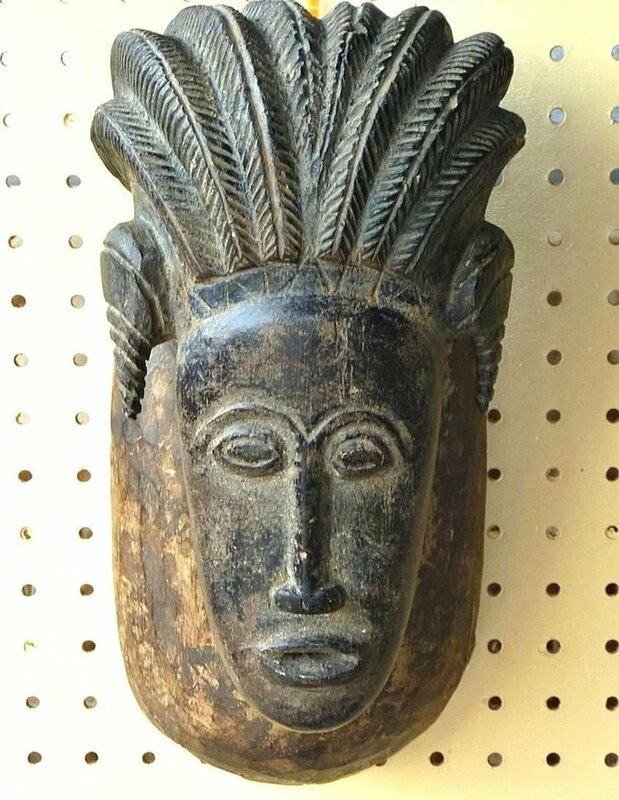 Below, on the right side is an interesting carved artifact, presumably from Benin. So far I have not found anything similar regarding this artifact. I would be very grateful for yours help! Inscription on right side: "Les auteurs ou complices de falsification ou de contrefaçon de billets de banque seront punis conformement aux lois at actes en vigueur". In English: "Authors or accomplices of falsification or counterfeiting of banknotes will be punished in accordance with the laws and acts in force". Denominations in numerals are in top corners, in words - top, right.